Source: 'Yearbook and Directory of Literary Society of St. Jerome 1906 , year 1906. 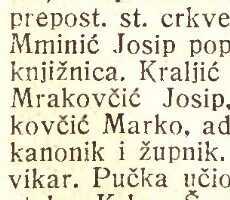 Source: 'Emigration Commission Zagreb , year 1923. Source: 'Emigration Commission Zagreb , year 1925. Source: 'Emigration Commission Zagreb , year 1928. Source: 'Emigration Commission Zagreb , year 1929.